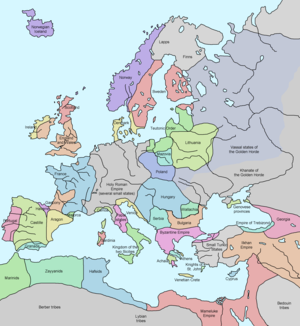 The Late Middle Ages or Late Medieval Period wis the period o European history generally comprisin the 14t an 15t centuries (c. 1301–1500). The Late Middle Ages follaed the Heich Middle Ages an precedit the onset o the early modern era (an, in much o Europe, the Renaissance). This page wis last eeditit on 22 Apryle 2017, at 17:38.